Following in the footsteps of his father Jim and brother Ross. ​Thank you for visiting the 'Kelso Civic Week' website. Whether you are visiting this site as a former Kelso Laddie or Colour Busser, fellow Kelsonian, child, teacher or friend from another town- we hope that you find this site informative and interesting. Help bring the community closer together through a common interest in our town amd local villages. Should you have any comments regarding the site or questions that you would like to ask then please don't hesitate to get in touch by clicking on the 'Contact Us' button at the foot of this page. Ellie Burton, Madison Wemyss, Skye Nairn, Codi Watson. Kelso Laddie Mark Henderson, son of Ex Laddie Jim Henderson and Wendy. R/H Man 2018 Ex Laddie Sean Hook, L/H Man 2017 Ex Laddie Craig Logan. 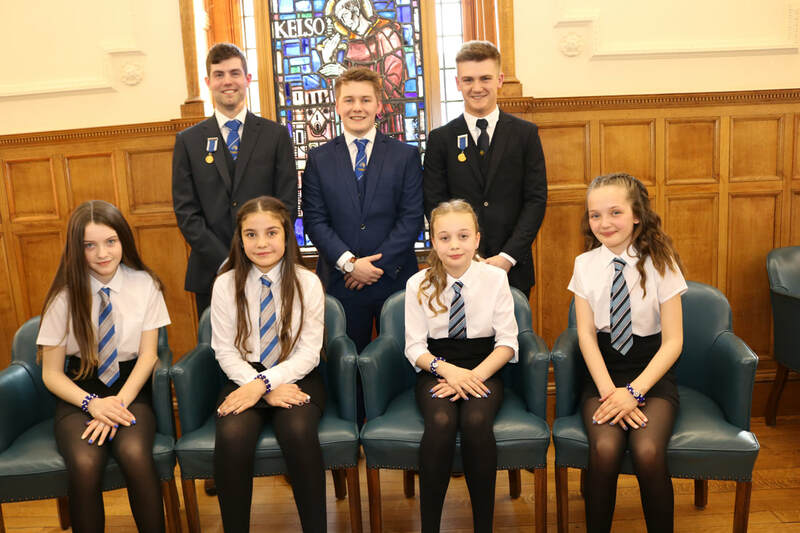 The Lady Bussers are Ellie Burton & Madison Wemyss from Edenside Primary and Skye Nairn & Codi Watson from Broomlands Primary. ​important Civic Week details please complete the form below. Take a look at some photos from Kelso Civic Week events from both this year and years gone by. Kelso, also known in local Scots as "Kelsae" or in Scottish Gealic as "Cealsaidh" is situated on the banks of the River Tweed at its confluence with the Teviot, Kelso is an ideal place to use as a base for exploring the Borders, the Berwickshire Coast and North Northumberland. Described by Sir Walter Scott as 'The most beautiful if not the most romantic village in Scotland', it has kept that atmosphere which he loved. With a population, today, of just over 6,000, it is large enough to have everything, but not too large to overwhelm. Protected to the north by the Lammermuir Hills and the Cheviots to the south, it lies in one of the most fertile valleys in the country. Being within ten miles of the English border, past history dealt the town a very hard time during the Border Wars of the thirteenth to sixteenth centuries. We will advise you when it is in the shops below. and of course it also contains full details of our 2019 events. bio on our principals for this year. Patrons of Kelso Civic Week are entitled to seating at the Installation Ceremony as well as other privileges. ​This is a great way to support Civic Week, subscriptions are only £5 per person. Anyone wishing to become a Patron should complete, sign and return the attached form (or use the tear out form on page 153 of the brochure) and we will be in touch. Thanks for your support.